This is the report for the week ending April 27th, 2018. 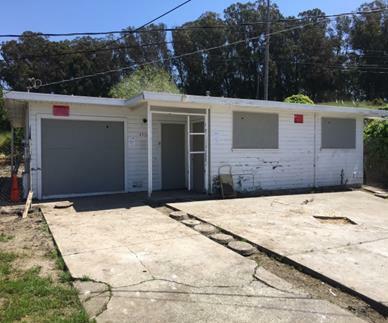 The next City Council meeting is scheduled for Tuesday, May 1st beginning with Closed Session at 5:30 PM, followed by the Regular Meeting of the Successor Agency to the Richmond Community Redevelopment Agency and Richmond City Council at 6:30 PM. The agenda may be found by clicking this link: Richmond City Council Agenda Packet. Administrative Professionals Day was observed in the United States this past Wednesday, April 25th. When this tradition began, the day was to recognize the contributions of administrative personnel to the economy; however, it has taken on some criticism, perhaps unfairly, in slighting those that are somehow viewed as mere "support staff." As part of Administrative Professionals Day, I will take the liberty in this report to acknowledge two individuals in the City Manager’s office that are outstanding administrative professionals, and are well beyond any notion of being mere “support staff” in the work that they do. Shané Johnson is the friendly “front desk” of the City Manager’s office, who provides outstanding staff work in a variety of forms. While observing her work answering telephones and greeting visitors, one might not appreciate the complexity of tasks that are the regular part of her responsibilities. But, one task that you might appreciate if you are reading this report is the fact that she prepares its initial draft each and every week, collecting, editing, and formatting the highlights that are identified by the various departments. For all that she does, and for this weekly report, I offer my thanks to Ms. Johnson. The other administrative professional in the City Manager’s office is practically a City of Richmond institution: the City Manager’s Executive Assistant Sue Kadlec. Many of you have had the pleasure of working with Sue whether she is responding promptly to a service issue that she gets into the hands of the correct department, scheduling a meeting, or taking care of a critical task before you even thought to ask her for help in resolving it. Her day-to-day responsibilities are complicated and voluminous, and no one could approach them with more grace. Sue is as accomplished at her job as anyone could ever be in any job that they undertake. However one defines the role of “Administrative Professional,” I can attest to the fact that Sue and Shané are only two of the many outstanding employees of the City, working in various functions throughout the organization. Whether I see them in a truck, a car, on a motorcycle, at a pool or a park, handling a sharp tool or a piece of equipment, or at a desk behind a computer screen, it is a privilege to work with them day in and day out, and I thank them for their service. The University of California Master Gardeners are hosting their annual Great Tomato Plant Sale at the Richmond Main Library this Saturday, April 28th (tomorrow). This event features a wide variety of tomatoes and other plants and veggies for sale at affordable prices. The Master Gardeners will be on hand to provide free expert advice to make your home garden a success. 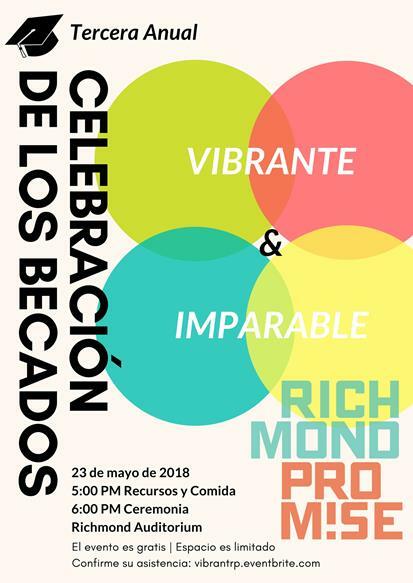 Tomorrow’s event is at the Richmond Main Library, at 325 Civic Center Plaza. Visit ccmg.ucanr.edu/tomato for more information, including sale locations and variety lists. On Saturday, April 28th, from 10:00 AM to 2:00 PM, the Richmond Police Department, in coordination with the Drug Enforcement Administration (DEA), will give the public an opportunity to prevent pill abuse and theft by ridding their homes of potentially dangerous expired, unused, or unwanted prescription drugs. This service is free and anonymous – no questions asked. The DEA cannot accept liquids, needles, or sharps - only pills or patches. This initiative addresses a vital public health issue. Medicines that languish in home cabinets are highly susceptible to diversion, misuse, and abuse. Rates of prescription drug abuse in the U.S. are alarmingly high, as are the number of accidental poisonings and overdoses due to these drugs. Studies show that a majority of abused prescription drugs are obtained from family and friends, including from the home medicine cabinet. 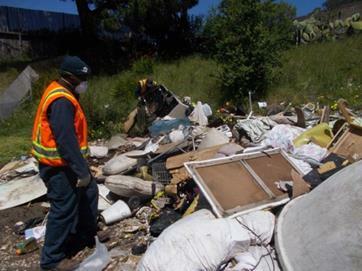 In addition, Americans are now advised that their usual methods of disposing of unused medicines – flushing them down the toilet or throwing them in the trash – pose potential safety and health hazards. 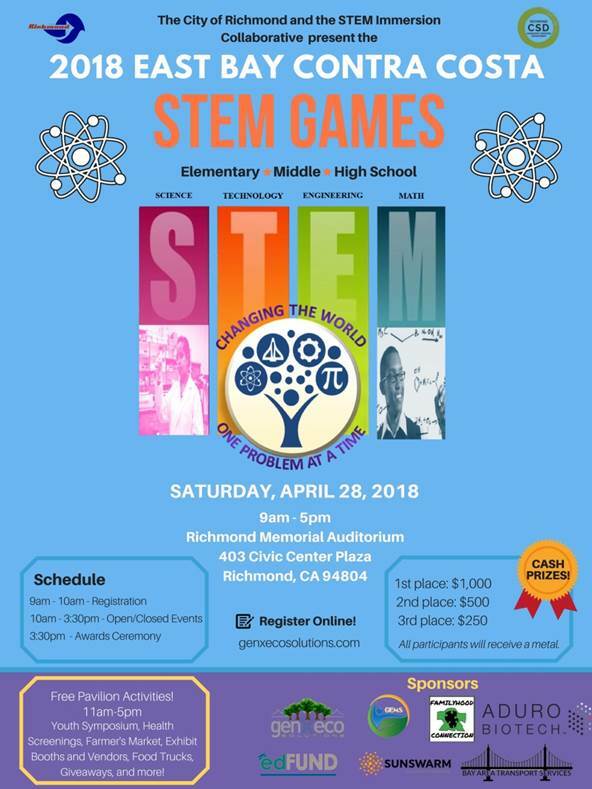 Join us on Saturday, April 28th for the East Bay Contra Contra Costa (EBCC) STEM Games! Elementary students are strongly encouraged to sign up for this special event. Scholarships are available! The games consist of 5 competitive team events which require knowledge of science and math topics applied by engineering and technology skills. The competition, similar to athletic games, captures the commitment, enthusiasm, and interest in STEM careers. All East Bay and Contra Costa County schools, communities, groups, and organizations can sign up for the competition. Teachers, parents, organization leaders, and adult mentors can participate as coaches. Participants can register on-site on the day of the event. Registration begins at 9:00 AM and the competition begins at 10:00 AM. Follow updates and more on our Facebook page! 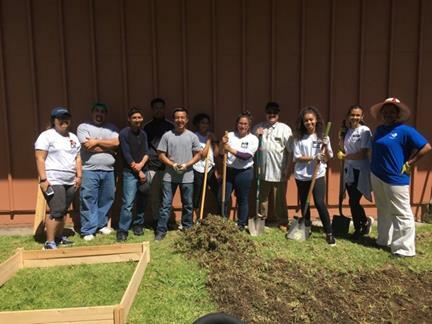 The City of Richmond Community Services Department, ServiceWorks, Contra Costa Health Services, and the National Park Service teamed together to organize 1 of the 14 premier celebrations happening around the Bay Area. We’ll be kicking off National Park Week, parks, healthcare agencies, service providers, and communities nationwide. 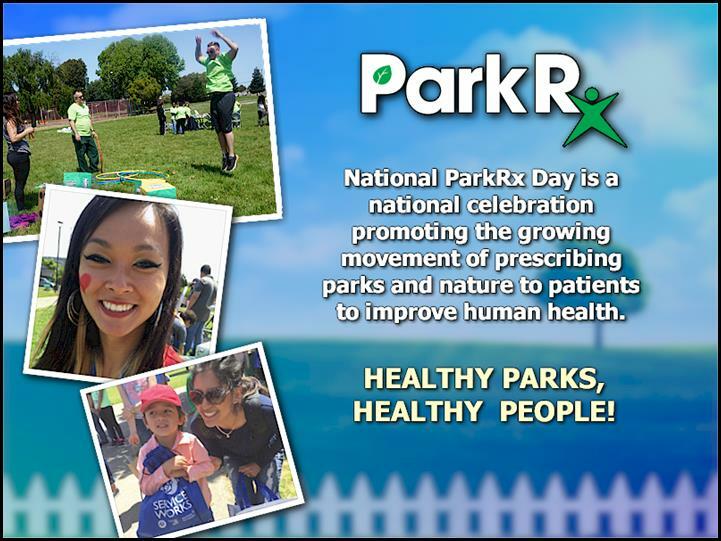 Join us as Richmond hosts their 3rd Annual Park Rx Day from 11:00 AM – 2:00 PM at John F. Kennedy Park. 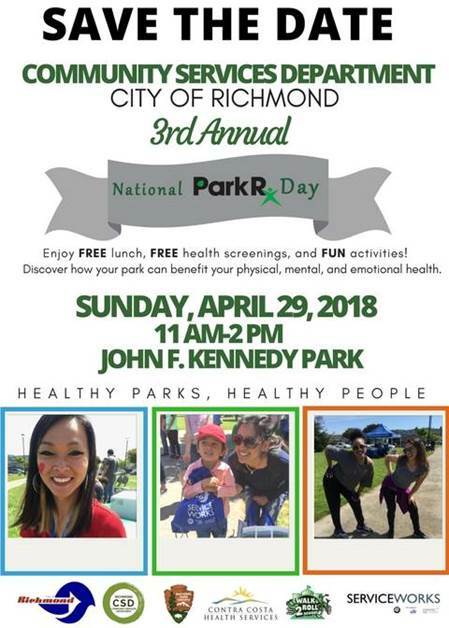 There will be lots of fun activities such as giveaways, fitness obstacle courses, ‘Walk with a Doc, bike rodeo, health screenings, face painting, mixed martial arts demonstrations and much more! 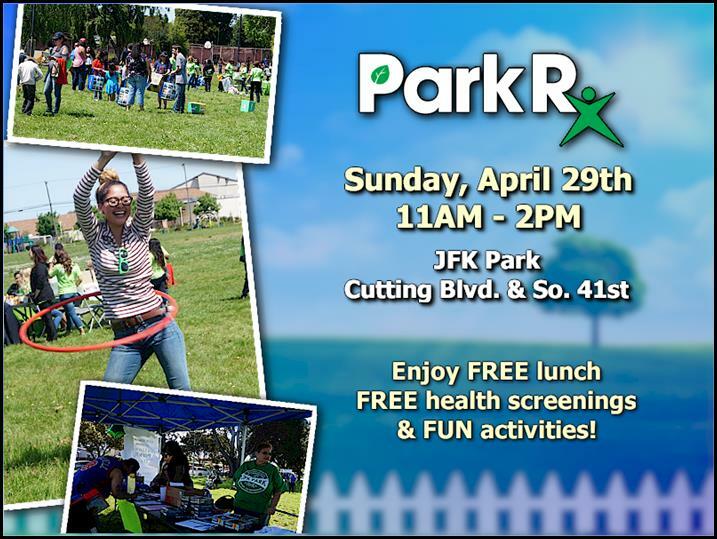 Park Rx Day is organized by Healthy Parks, Healthy People: Bay Area, a collaborative comprising more than 30 park, health, and community-based organizations united by a vision to improve the health and wellbeing of all Bay Area residents, especially those with high health needs, through the regular use and enjoyment of parks and public lands. For more information, contact Vanessa Chau at Vanessa_Chau@ci.richmond.ca.us or at (510) 620-6552. 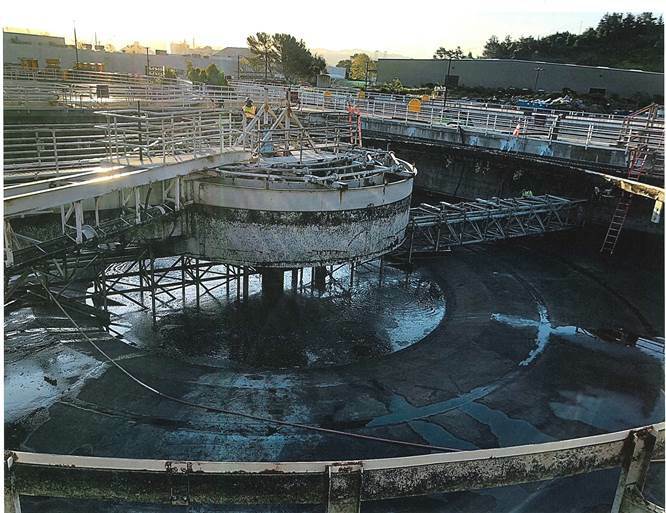 The City of Richmond’s wastewater treatment plant (WWTP) is an aged facility, originally built in 1953, and many process structures have deteriorated and are in immediate need of replacement or rehabilitation. 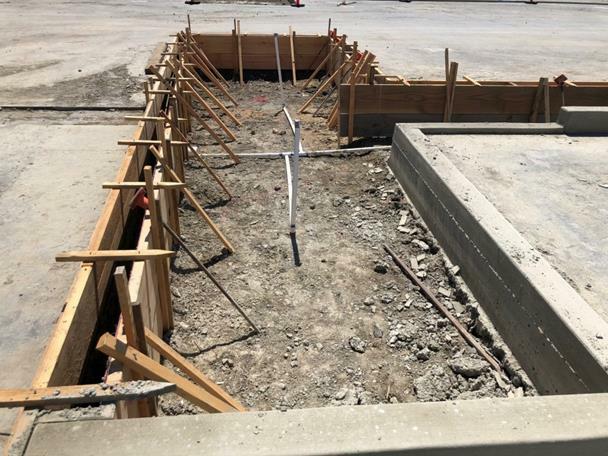 This past week, the Department of Water Resource Recovery and Veolia, the City’s contract wastewater manager, started the rehabilitation of the secondary clarifier #2 – one of the critical projects at the WWTP. 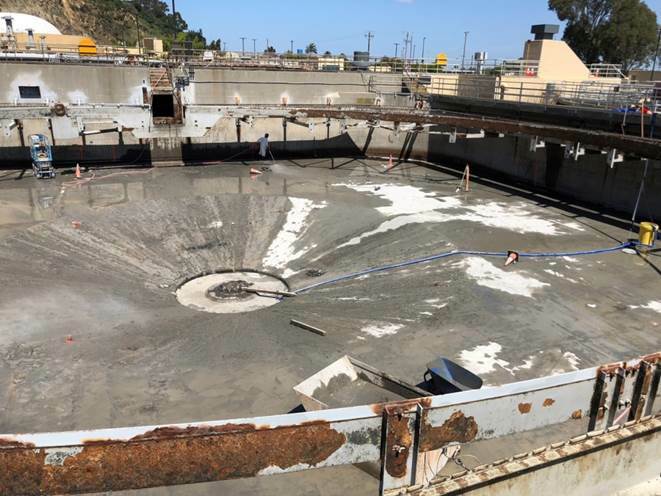 This work is part of an overall progressive design-build effort with Carollo Engineers and Overaa Construction, and is the second of three clarifiers scheduled to be systematically demolished and rehabilitated with new internal stainless steel components. Clarifier #1 was completed last year before the rainy season, with #2 and #3 to be completed by this coming October. Funding for this extremely important work is made possible from the 2017A wastewater revenue bonds issued in August last year. I have listed below some of the topics for meetings that I attended during the past week in the hope that it provides an idea of the varied issues with which our organization deals routinely. Participated in my monthly check-in meeting with (WCCUSD) Superintendent Matt Duffy. These meetings were in addition to attending the regular management staff meeting, agenda planning, reviewing staff reports to the City Council, doing department head “check-ins,” having discussions on various personnel matters, and having short discussions with staff, community members, members of the press, etc. Those interested may apply either in person or online at: https://richmond.getapermit.net. Areas with permit parking will have limited short term parking for those without permits between specified hours, and extended parking for residential vehicles displaying area permits within posted times of the day. Short term visitor and reserved disabled parking permits are also available for purchase. 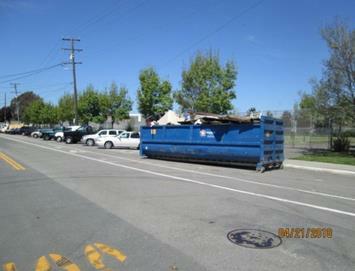 http://www.ci.richmond.ca.us/3329/Parking-Management-Services or call (510) 621-1718 to schedule an appointment. April’s Contra Costa County Mayors Conference featured a presentation by Ali Saidi, Deputy Public Defender Immigration Attorney with the Office of the Contra Costa County Public Defender, who helped develop the Stand Together Contra Costa program, and now serves as the Director of Stand Together CoCo. 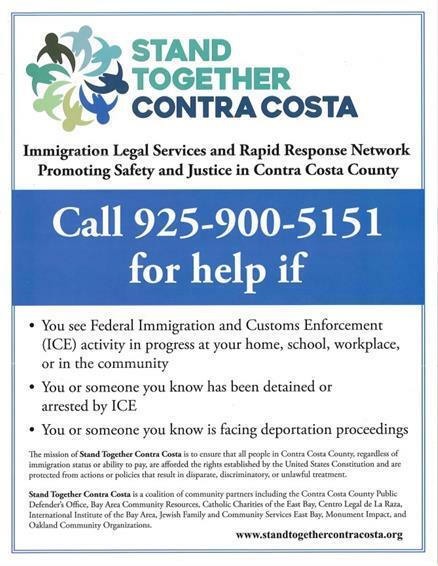 As described in its website (www.standtogethercontracosta.org), Stand Together Contra Costa is a rapid response, legal services, and community education project to support safety and justice for immigrant families in Contra Costa County. 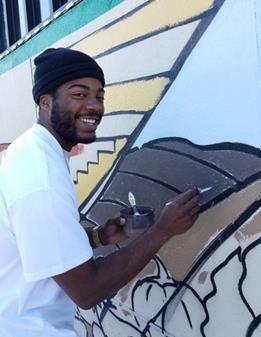 The program is a partnership between Contra Costa County, philanthropy, and community-based organizations, and provides culturally competent, no-cost rapid response support, legal defense services, and immigrant rights education and training to support families impacted by anti-immigrant policies and practices affecting Contra Costa County residents. 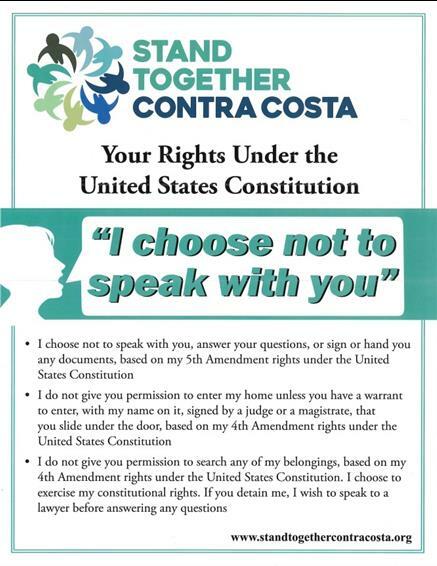 The mission of Stand Together Contra Costa is to ensure that all people in Contra Costa County, regardless of immigration status or ability to pay, are afforded the rights established by the United States Constitution, and are protected from actions or policies that result in disparate, discriminatory, or unlawful treatment. Stand Together Contra Costa will not only provide legal consultation and representation to those facing the complex system of immigration law, but will also provide community-based education, trainings, and workshops to ensure that Contra Costa’s immigrant families have meaningful access to information about our civil rights while promoting more robust civic engagement with the many programs and services available in Contra Costa. Please see the following for more information regarding Stand Together programs, or visit the website at www.standtogethercontracosta.org. En Abril la Conferencia de Alcaldes del Condado de Contra Costa presentó una presentación de Ali Saidi, Abogada de Inmigración Defensor Público Adjunta con la Oficina del Defensor Público del Condado de Contra Costa, quien ayudó a desarrollar el programa Stand Together Contra Costa y ahora se desempeña como Directora de Stand Together CoCo . 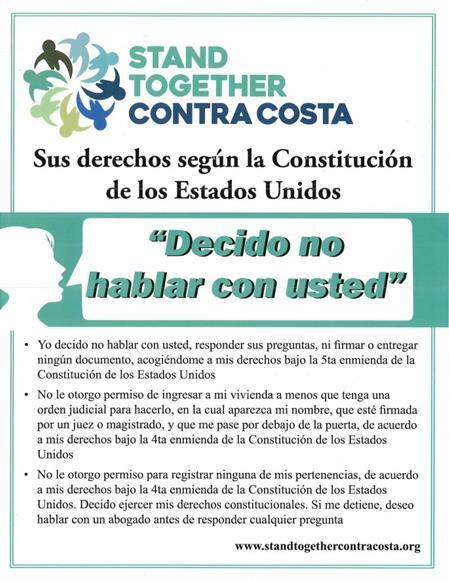 Como se describe en su sitio web (www.standtogethercontracosta.org), Stand Together Contra Costa es un proyecto de respuesta rápida, servicios legales y educación comunitaria para apoyar la seguridad y la justicia para las familias inmigrantes en el condado de Contra Costa. El programa es una asociación entre el Condado de Contra Costa, filantropía y organizaciones comunitarias, y brinda apoyo de respuesta rápida culturalmente competente, sin costo, servicios de defensa legal y educación y capacitación en derechos de los inmigrantes para apoyar a las familias afectadas por políticas antiinmigrantes y prácticas que afectan a los residentes del Condado de Contra Costa. La misión de Stand Together Contra Costa es garantizar que todas las personas en el Condado de Contra Costa, independientemente de su estatus migratorio o capacidad de pago, tengan los derechos establecidos por la Constitución de los Estados Unidos, y estén protegidos de acciones o políticas que resulten dispares, trato discriminatorio o ilegal. 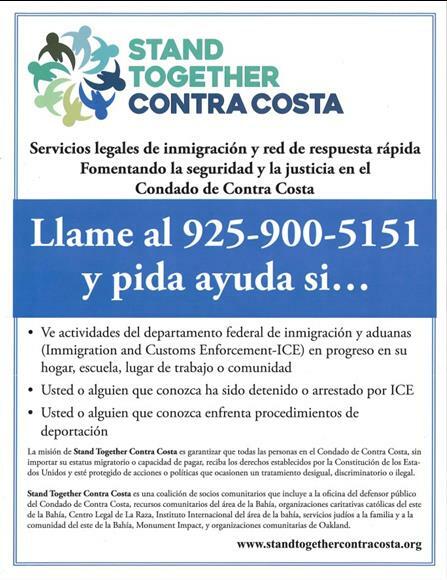 Stand Together Contra Costa no solo brindará asesoramiento legal y representación a quienes enfrentan el complejo sistema de leyes de inmigración, sino que también brindará educación, capacitaciones y talleres basados ​​en la comunidad para garantizar que las familias inmigrantes de Contra Costa tengan acceso significativo a la información sobre nuestras derechos mientras se promueve un compromiso cívico más sólido con los numerosos programas y servicios disponibles en Contra Costa. Consulte lo siguiente para obtener más información sobre los programas de Stand Together o visite el sitio web en www.standtogethercontracosta.org. 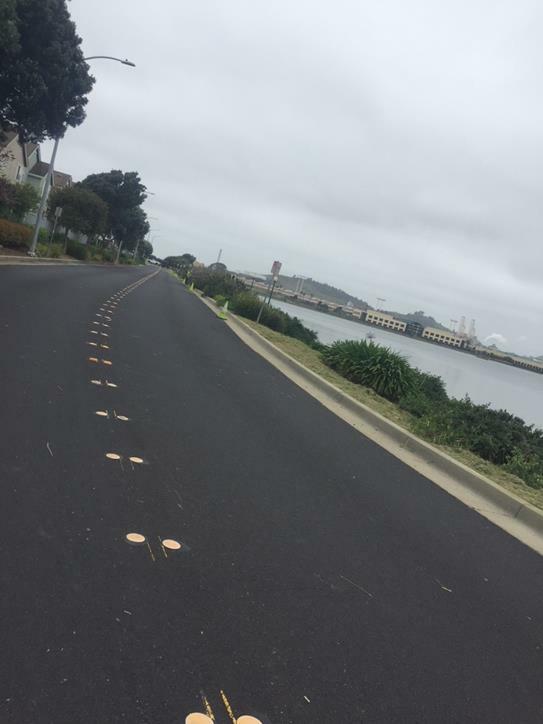 San Pablo Avenue Complete Streets Project: Construction is Underway! 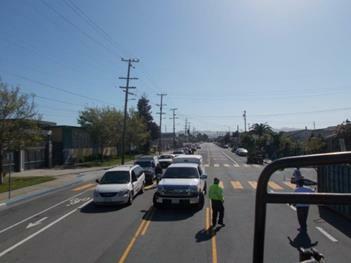 The San Pablo Avenue Complete Streets Project is a federally funded corridor enhancement project that focuses on multimodal access, safety and connection along San Pablo Avenue between Rumrill Boulevard and La Puerta Road. 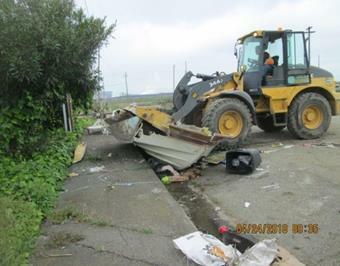 The project is a partnership between the cities of San Pablo and Richmond, with major funding ($5.978 million) from a One Bay Area Grant (OBAG). 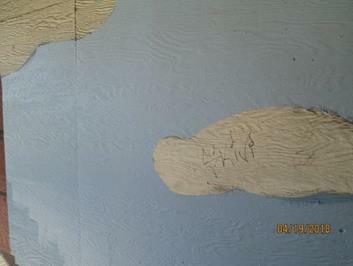 The City of San Pablo is the lead agency for the project. 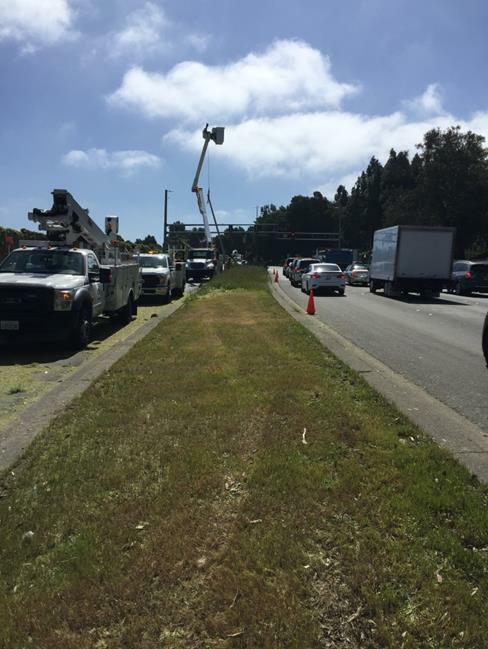 Public notices have been sent to nearby neighbors, storm water protection measures have been installed, and the contractor is surveying and staking portions of the roadway to prepare for relocating the roadway median. The project is anticipated to last about five months. 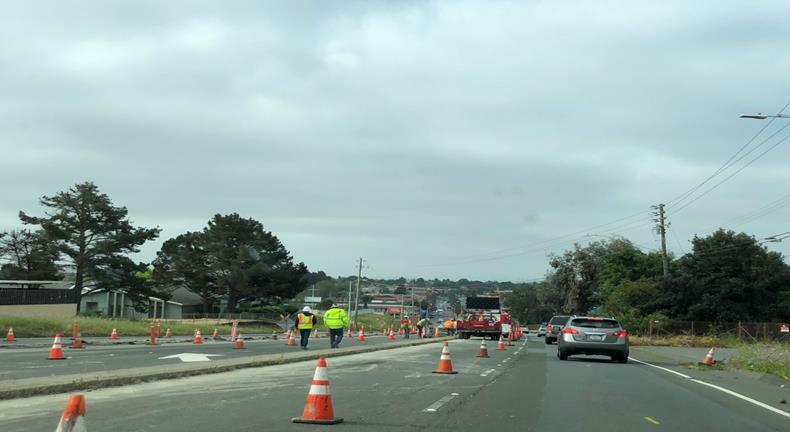 San Pablo Avenue will remain open to traffic in both directions at all times; however, for safety reasons, there will be times during construction when only one travel lane in each direction is available for vehicular traffic. Construction questions can be directed to the Construction Manager, Jaemin Park, at jpark@park-eng.com or (925) 818-3756. 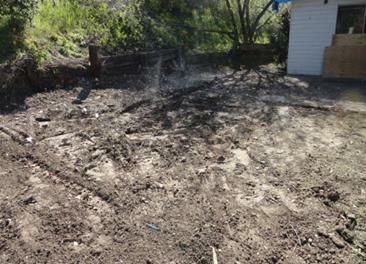 This week, construction started with partial demolition of existing roadway to accommodate new roadway alignment. May is National Bike Month! 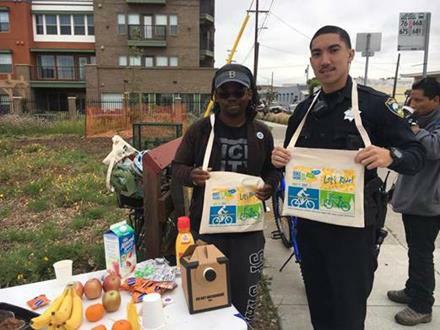 On Thursday, May 10th, the City of Richmond in collaboration with Bike East Bay, 511 Contra Costa, Richmond BPAC, Rich City Rides, and SunPower, will be hosting four Energizer Stations across the Richmond community. 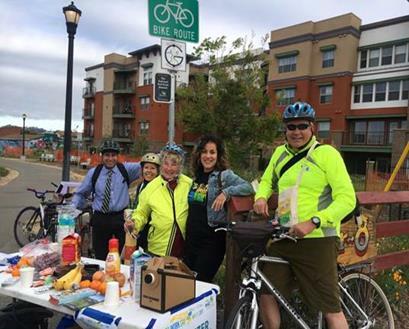 Stop by on your way to work for refreshments and a Bike to Work Day bag filled with promotional materials from local businesses. 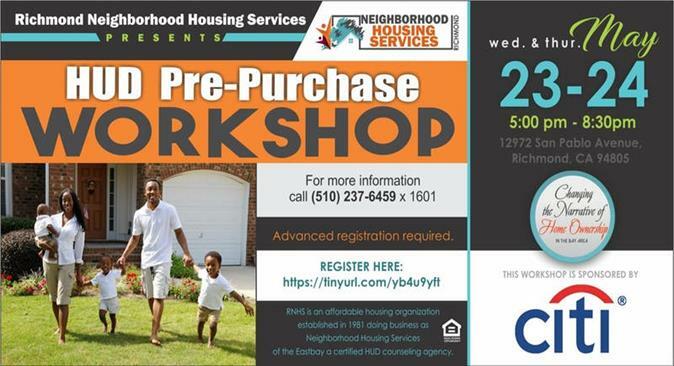 Join the Richmond Neighborhood Housing Services for an informative workshop on home purchasing. The goal of the workshop is to provide information to assist individuals in navigating the homebuyer process, and bringing them closer to homeownership. 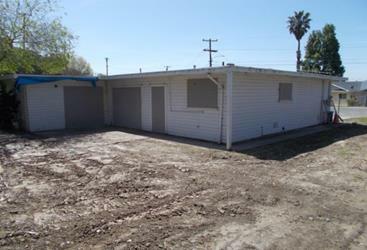 Many community lending First Time Home Buyer (FTHB) programs require this class. Note: This is a two-part series and attendees must attend both classes to receive a HUD completion certificate. 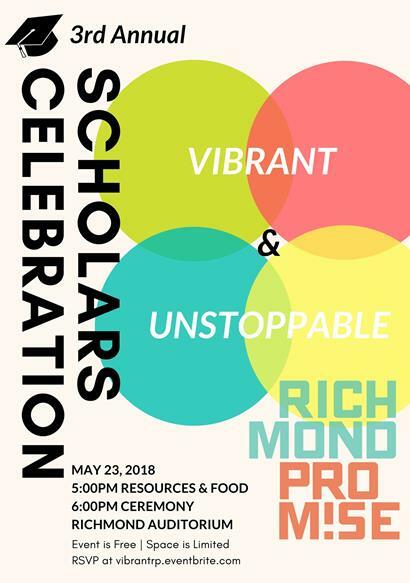 Save the Date: Richmond Promise Scholars Celebration is Wednesday, May 23rd! The Scholars Celebration is an annual community-wide event to honor the 500+ vibrant and unstoppable Richmond Scholars in the class of 2018, to recognize their families, and our education and civic partnerships critical to their success, and celebrate what the Promise means to the Richmond community. Last year, the event drew nearly 1,000 students and families. We hope to see you there! The event is free, but space is limited. Check Out Next Steps for College Success! Sign-Up Workshop for Free Home Solar Systems for Qualifying Richmond Residents!! 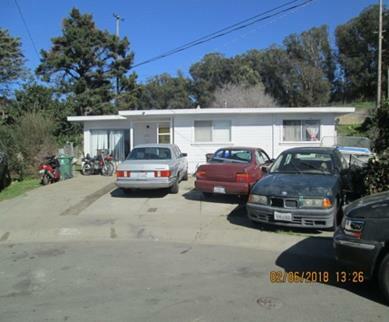 Richmond homeowners can now qualify for a FREE solar program funded by the City of Richmond and State of California, through the non-profit GRID Alternatives. 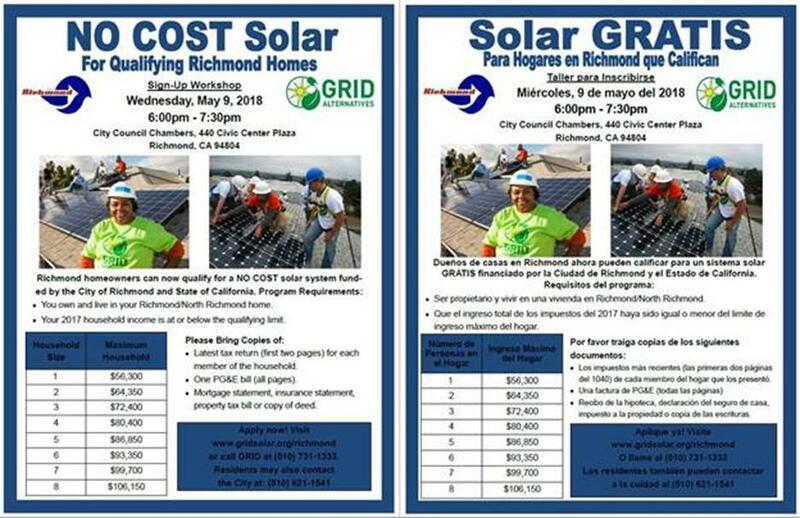 Qualifying homeowners are invited to attend the City of Richmond and GRID Alternatives' sign-up event on Wednesday, May 9th from 6:00 PM to 7:30 PM in the Richmond City Council Chambers located at 440 Civic Center Plaza. Light snacks will be provided. GRID Alternatives is a national non-profit organization that makes solar energy accessible to homeowners who need the savings the most, while providing hands-on solar installation training. You could save 60-90% on your electric bill and help our community reduce its greenhouse gas emissions by participating in the program. To be eligible, Richmond and North Richmond residents must live in their own home and make less than 80% of area median income (income limits are included in the flyer below and at http://www.richmondenvironment.org/). 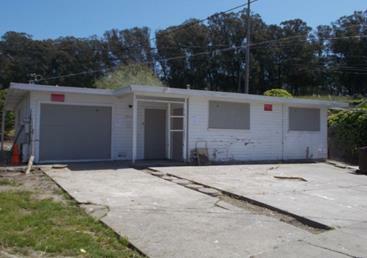 For more information, please contact GRID Alternatives at (510) 731-1333 or visit http://www.gridsolar.org/richmond. 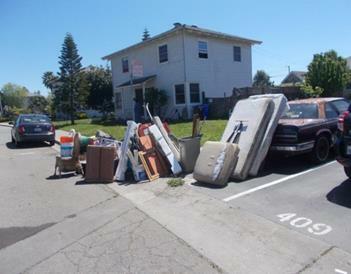 Residents may also contact the City of Richmond at (510) 621-1541. Apply for Your U.S. Passport at Richmond City Hall! Please recognize that the area is an operational executive office, and a quiet zone. No drop in service for same day appointments or scheduling future appointments is available at this time; you must call (510) 620-6786 to schedule all appointments. For application forms, information on documentation required, fees, and a wealth of other passport and international travel information, visit the only official website for passport information – travel.state.gov. 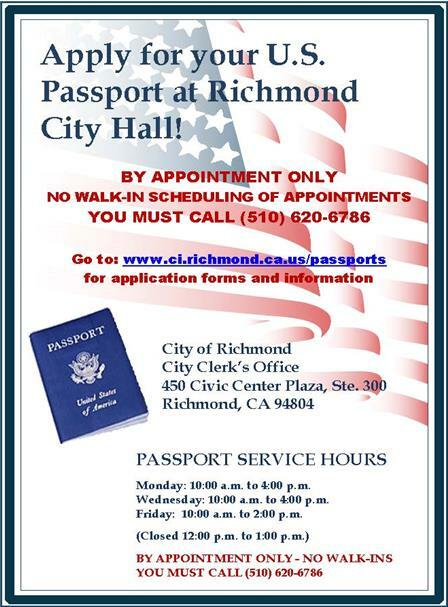 For more information about the City of Richmond Passport Acceptance Facility, please visit http://www.ci.richmond.ca.us/passports. Join us for the 36th Annual Senior Information & Health Faire on Wednesday, May 9th from 9:00 AM to 12:00 PM at the Richmond Auditorium. 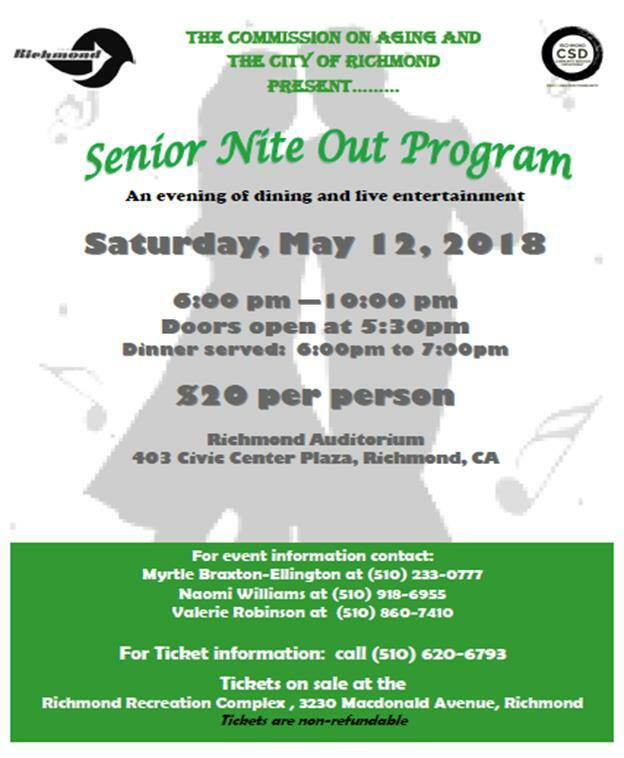 Mark your calendars for an evening of dining and dancing on Saturday, May 12th at the Senior Nite Out Program. Tickets can be purchased from the Community Services Department at 3230 Macdonald Avenue. 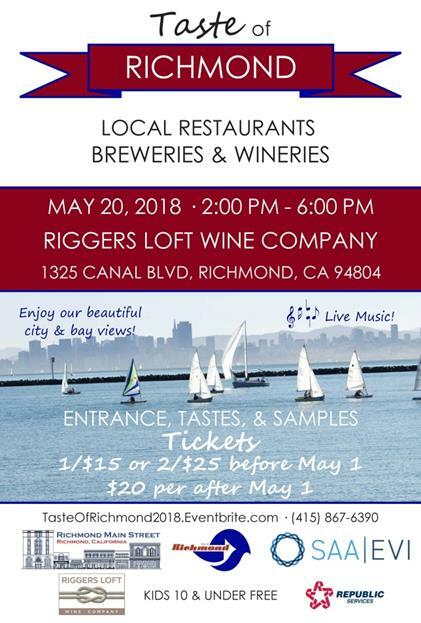 Call (510) 620-6793 for ticket information. The Richmond Commission on Aging is looking for seniors age 55 or over to become a member of the Commission. The purpose of the Commission is to enhance the quality of life for older adults with an emphasis on health, wellness and independence. If you are age 55 or older and reside in the West Contra Costa County which includes areas within WCCUSD boundaries, consider joining this active Commission that is dedicated to enhancing the quality of life of seniors. Please contact Chair, Myrtle Braxton, at (510) 233-0777 for additional information. 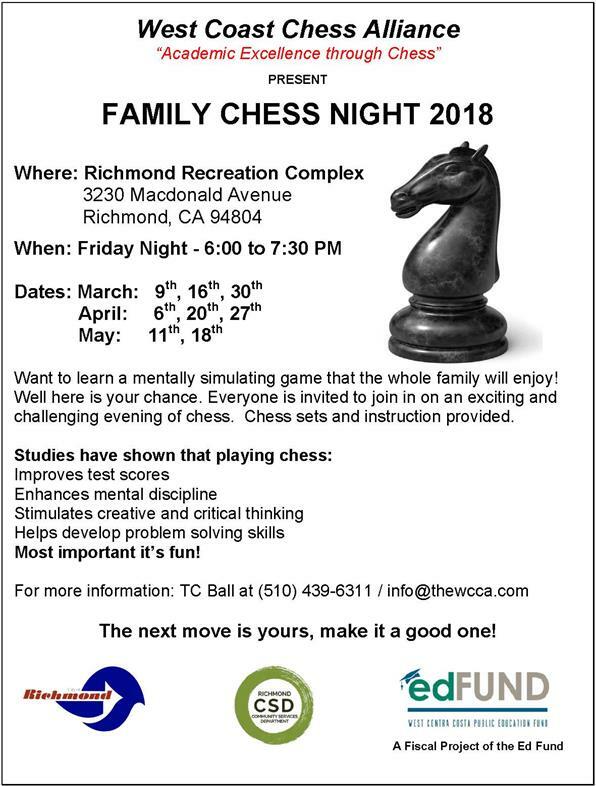 Family Chess Night – Weekly! 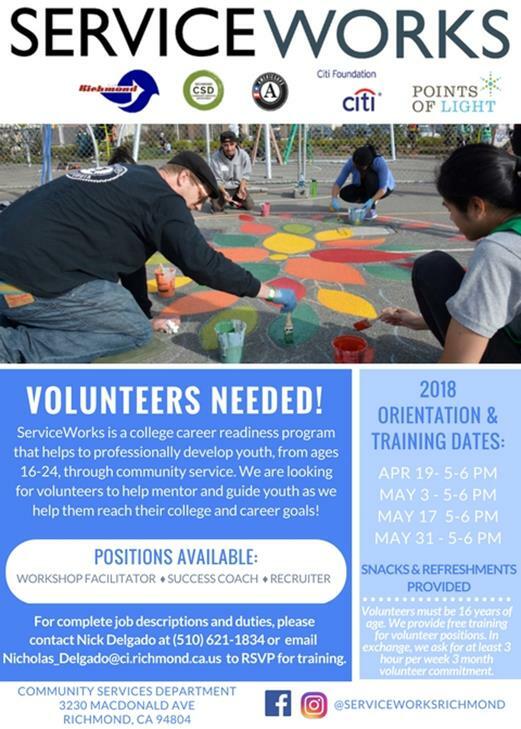 ServiceWorks, in conjunction with the City of Richmond Community Services Department, Points of Light, AmeriCorps and Citi Foundation, is actively recruiting volunteers to assist with groundbreaking programming. The program’s primary goal is to engage young adults (16-24 years of age) and bring educational modules that drive skill building, volunteering, and success coaching as strategies to help address barriers to youth economic opportunity. The program offers the opportunity for participants, also known as Service Scholars, to gain valuable college and career experience to which they may not have easy access. Through developing their own service projects and team exercises, Service Scholars will have the opportunity to gain a range of skills. Volunteers are vital to the success of this program. We are looking for all who wish to make a positive impact on the lives of the youth within our community. Whether it is for a week, a day, or even just a few hours in a month, you can help empower the service scholars to face any obstacle that they may block their path towards sustainable community development. ServiceWorks gives youth the keys to unlock their future; we are looking for volunteers who will give them the means to open the door. 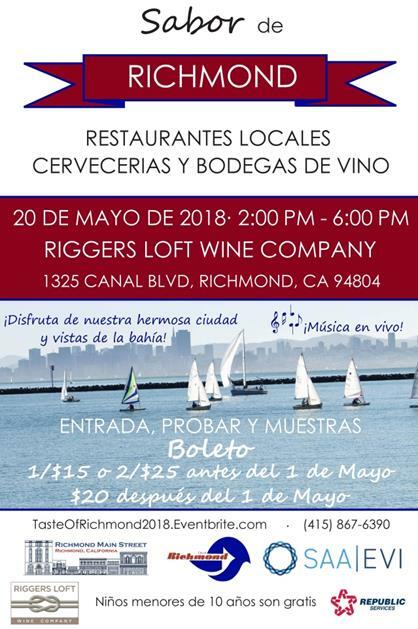 For more information, please contact: Nicholas Delgado (510) 621-1834, or email: Nicholas_Delgado@ci.richmond.ca.us. 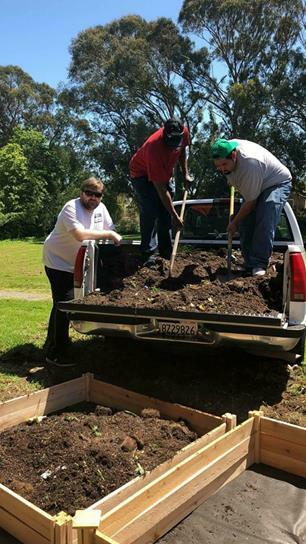 ServiceWorks Richmond had a capstone project for Earth Day this past weekend. 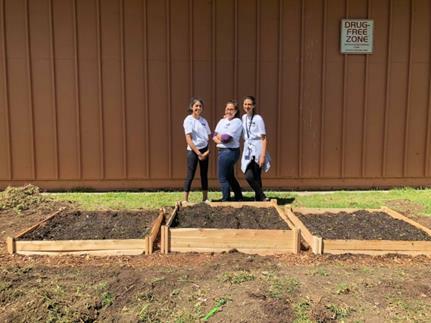 They spent the weekend building a community garden at the Booker T. Anderson Park with their scholars who attend the Leadership-in-Training Program at the park’s community center. We are very proud of this group of young leaders who were able to plan this project and see it through to the end. 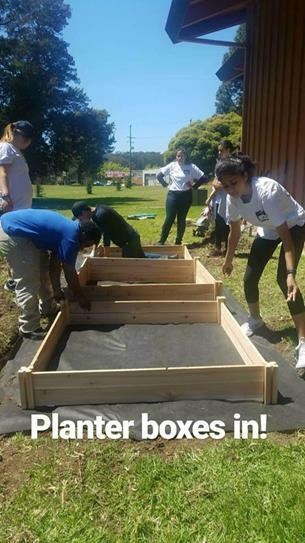 Using tools that were borrowed from the Richmond Tool Library, several youth volunteers helped build the planter boxes and till the soil. They were able to plant an assortment of herbs and vegetables with seeds they acquired from the Richmond Seed Lending Library. It was a successful event and the community is excited to tend to the garden and harvest the many foods that will grow. 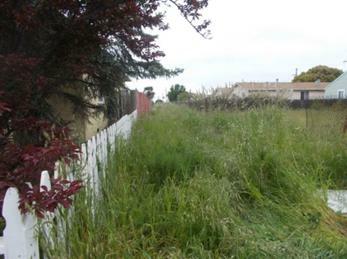 Our scholars are hoping to expand the garden in the future with the help of other community leaders. 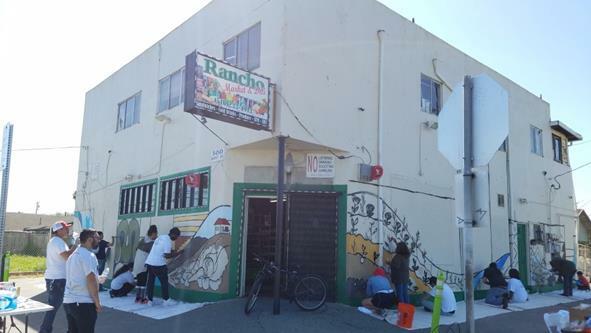 This past weekend, community members in Richmond painted a mural in honor of Earth Day at the Rancho Market on Market Avenue near 5th Street. 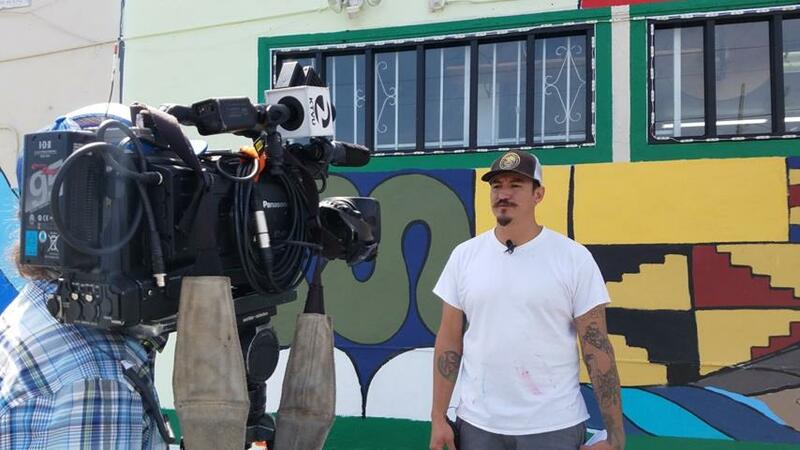 In addition to the Rancho Market Community Paint Day event, Love Your Block had their #loveyourblock chalkboard art installation up at Shields-Reid Park. The new Love North Richmond Resident Leaders Driscoll, Clarence, Ziana, and Karen led this activity. 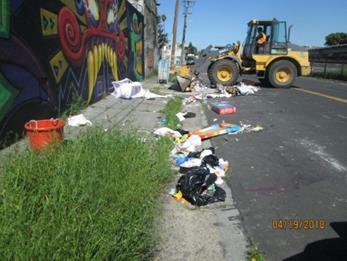 They asked residents, "How would you make a difference in North Richmond?" 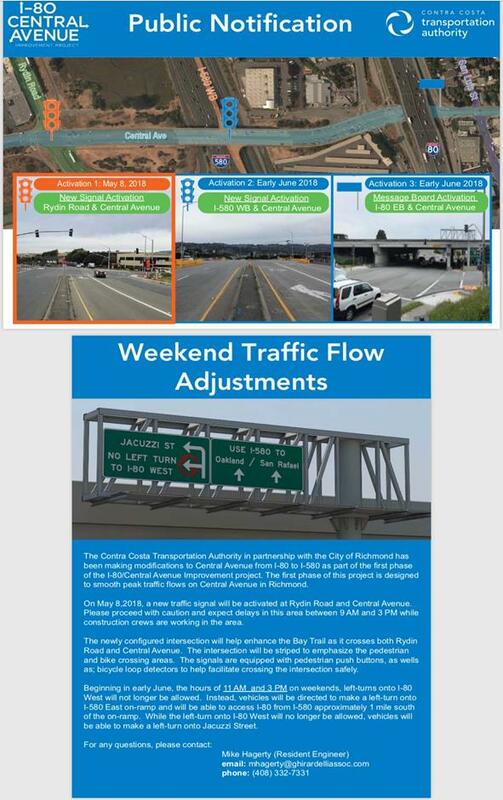 This past week, contractors began forming the barrier rails on the over-crossing bridge and posting traffic signs at the Rydin Road and Central Avenue interchange. 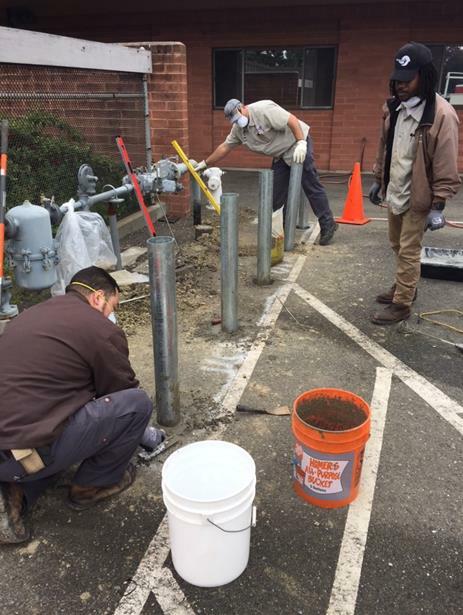 Next week, the contractors will complete forming and pouring barrier rails. On May 8th, a new traffic signal will be activated at Rydin Road and Central Avenue. Please proceed with caution and expect delays in this area between 9:00 AM and 3:00 PM while construction crews are working in the area. 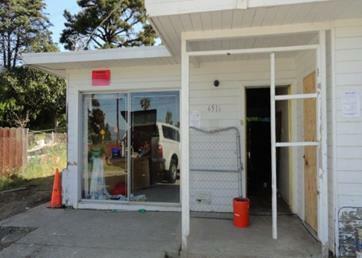 Please visit the project webpage for more information: www.ccta.net/projects/project/36 or call Community Outreach Representative Jacqueline Majors at (510) 882-1603; or email: I80CentralAve@gmail.com. 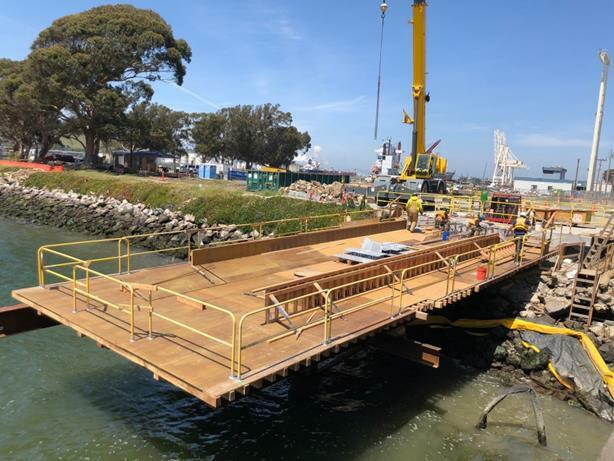 The Richmond Ferry construction continues progress as scheduled with pier anchorage completed and work being performed on the pier deck. Additionally, parking areas are being formed for concrete pours which are scheduled for Saturday, April 28th. 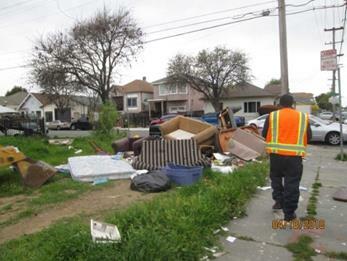 Abatement crews abated and secured private properties in the Parchester Village & the Eastshore Neighborhoods, assisted 30 seniors in the Iron Triangle/Atchison Village clean-up, abated weeds on City-owned alleyways, and continued to remove tons of illegal dumping and graffiti throughout the City. 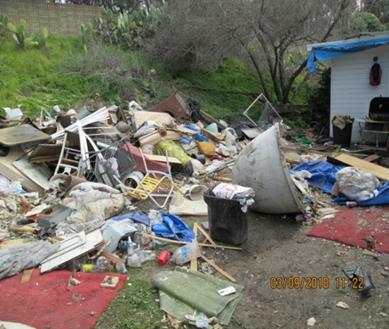 Code Enforcement staff has received numerous complaints about occupants of a property using a generator to power the residence and large amounts of trash and debris in the back yard. 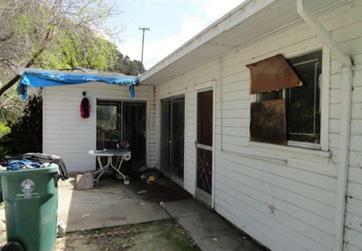 An inspection was conducted and the habitants of the property had no documentation of the legal right to occupy the property. 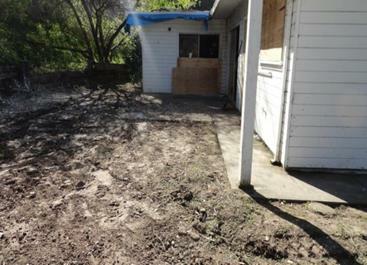 The residence also had no utilities. 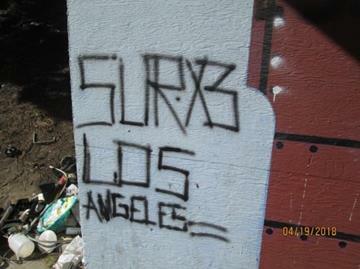 The home was red tagged and the occupants were removed. 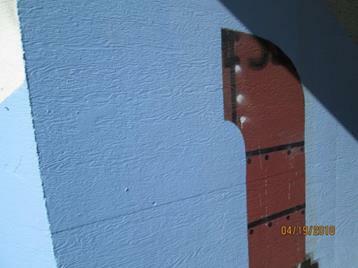 There was a notice issued and compliance was not met. 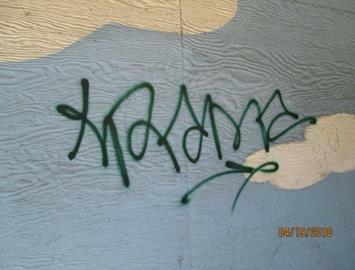 A warrant was obtained to board, secure, and clean the exterior of the property. 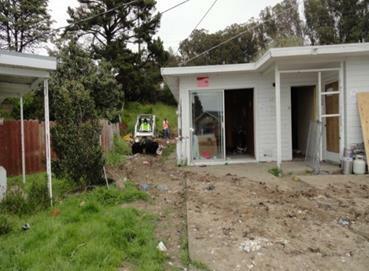 With the assistance of the Abatement division, the home was secured and the exterior was cleaned. Stationary Engineers performed routine pool tests and boiler inspections, installed new bollard in front of the gas meter at Fire Station #64, replaced the thermostat in the child care area of the Recreation Complex, installed a utility sink at Fire Station #67, cleared the main sewer line at the Recreation Complex, placed lockers at the Art Center, cleared a clogged sink in the women’s restroom at the Recreation Complex, and installed a new keyboard tray for staff. 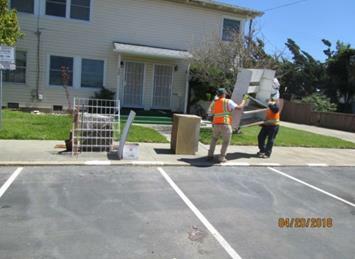 Utility Workers cleaned the Transit Center, scrubbed floors at the Richmond Swim Center, changed light bulbs at 440 Civic Center Plaza, continued to perform court yard clean up at Civic Center Plaza, set-up various rooms for events, set-up the Council Chambers and maintained 29 City-owned facilities. General Maintenance crews performed irrigation repair on the medians of San Pablo Avenue, repaired play equipment at Wendell Park, installed new rule signs at Kern, Solano, Burg and Humboldt Parks, weed-whipped the medians on Cutting Boulevard from South 37th Street to South 41st Street, and weeded Kern Park and the Clinton Avenue soundwall. 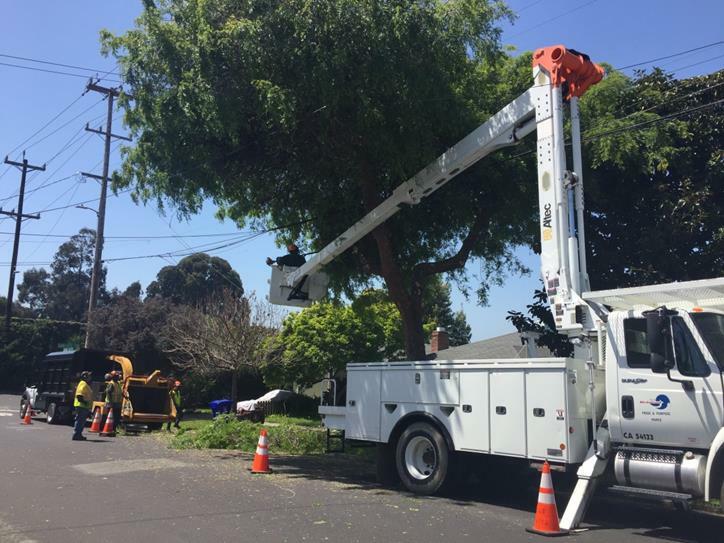 The tree crew removed or trimmed trees on: 30th Street, 32nd Street, 37th Street, Costa Avenue, Macdonald Avenue, and Huntington Avenue. 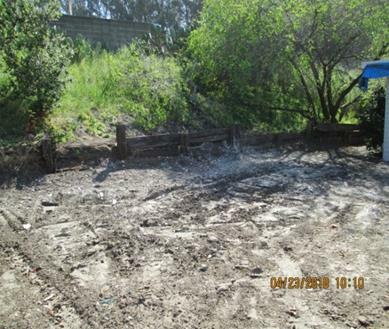 Hilltop District crews continued general maintenance around the business area, continued clean-up on the Richmond Parkway, and started weed abatement at Bay Vista, Country Club Vista, and Vista Del Mar Parks. 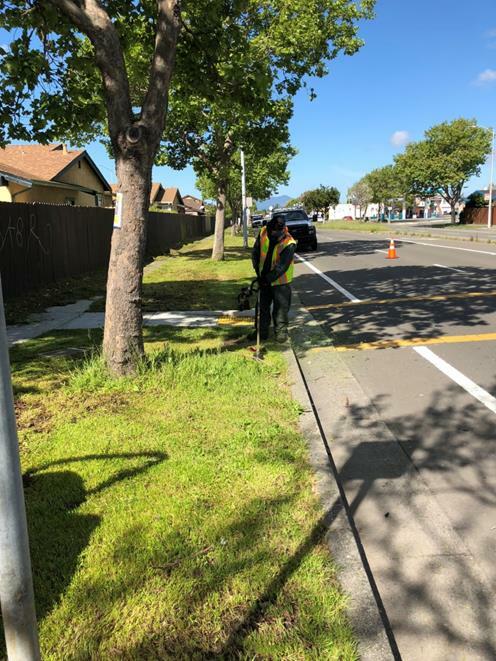 Marina District crews continued with the Regatta Boulevard improvements on the medians, repaired a portion of the sidewalk in the area, mulched beds for weed control, and performed weed abatement throughout the location. 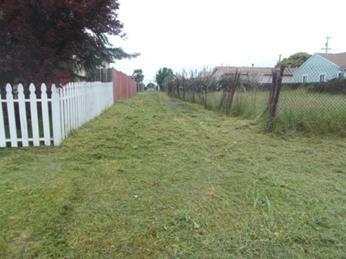 Crews also abated the Esplanade trail and performed weed abatement at Lucretia Edwards Park. Feel free to contact me if you have any questions or comments about these or any other items of interest to you. See below to see options for connecting with the City of Richmond. The City’s website (http://www.ci.richmond.ca.us/) provides a department and staff directory at http://www.ci.richmond.ca.us/Directory.aspx. If you’re not sure which department you need to contact, or, if you don’t receive a call back (which should not happen) from your original call or message, we encourage you to phone the City Manager’s office at (510) 620-6512. 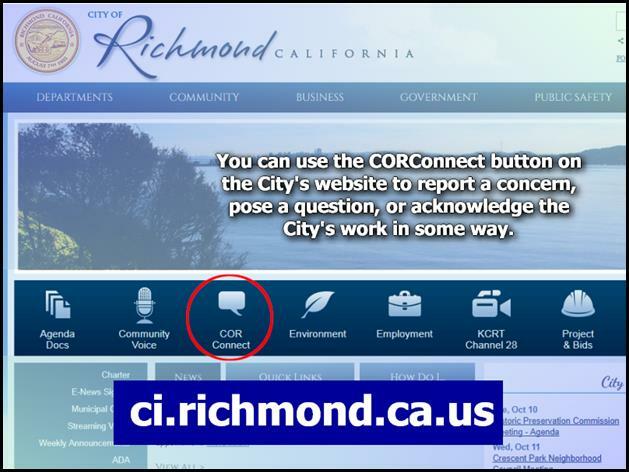 You can use the CORConnect button on the City’s website (http://www.ci.richmond.ca.us/) to report a concern, pose a question, or acknowledge the City’s work in some way. These CORConnect issues go directly to the responsible department, and the city manager reviews reported issues on a regular basis to determine if City staff members are responding appropriately. 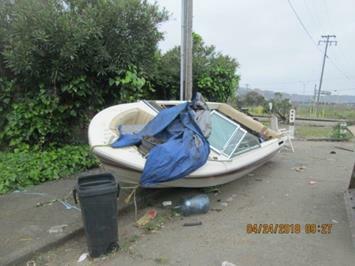 If you do not feel that you have received a satisfactory response, please contact the City Manager’s office at (510) 620-6512. 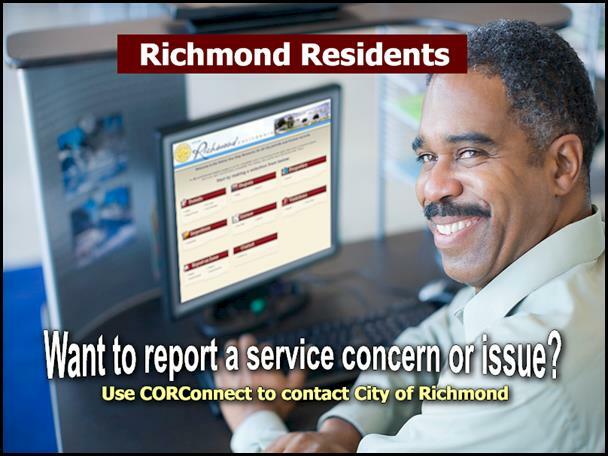 To access CORConnect select the CORConnect button on the homepage of the City website. Alternatively you can select the COR Connect button on any other webpage on the left hand side of the page. 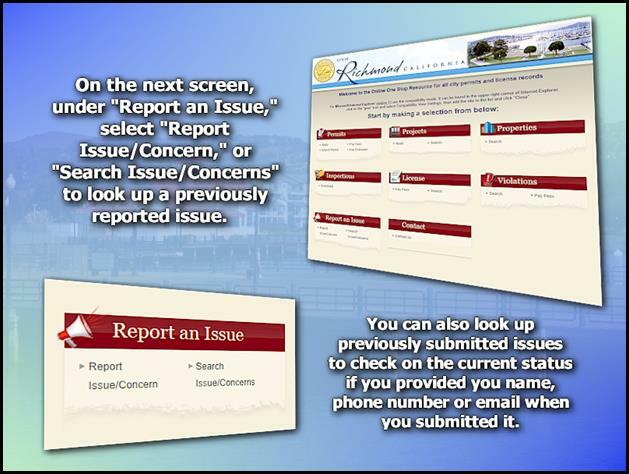 On the next screen under Report an Issue select Report Issue/Concern to create a report or Search Issue/Concerns to look up a previously reported issue. You can also look up previously submitted issues to check on the current status if you provided you name, phone number or email when you submitted it. On the page, you can also look up information on a parcel, see permits issued and look up business license information. If you have a current business license you can pay to renew it online with a credit card. The recommended browsers are: Microsoft Edge, or Microsoft Internet Explorer version 11 using the compatibility mode. It can be found in the upper right corner of Internet Explorer: click on the "gear" icon and select Compatibility View Settings, then add the site to the list and click "Close". 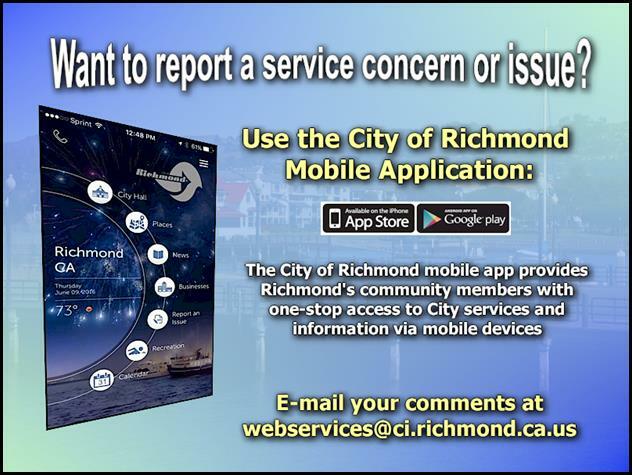 The City of Richmond mobile app provides Richmond’s community members with one-stop access to City services and information via mobile devices. The app allows quick and real-time reporting of neighborhood-related issues; viewing the City’s events calendar; finding addresses and phone numbers of local businesses, city departments and council members. 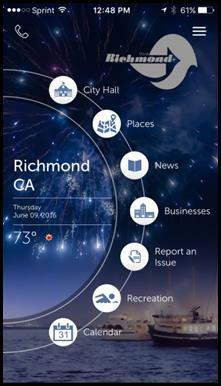 The City of Richmond’s mobile phone app is available on the Apple App store and Google Play store.